Three kayakers from the Thurso based Pentland Canoe Club have successfully passed their Scottish Canoe Association Coach Level 2 Award. Simon Copsey, Andy Ford and Martyn Sutherland were assessed by one of Scotland's leading kayak coaches, Jas Hepburn from Speyside. 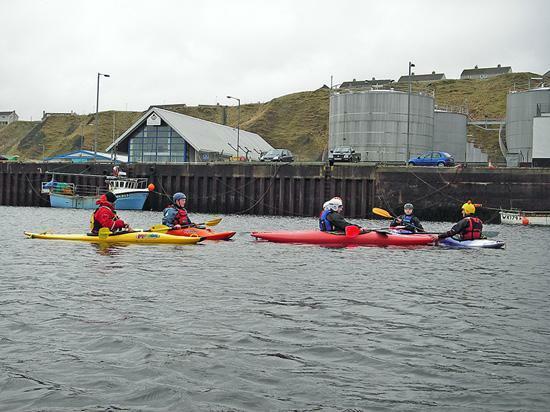 The course took place at Scrabster and was supported by a Caithness Sports Council RWE NUKEM Coaching grant. Yes we know it's winter but lots of clubs are actively gearing for the better weather. If the diving below the water is not for you as yesterdays ad how about on top of it. Three kayakers from the Thurso based Pentland Canoe Club have returned from a sea kayaking expedition in Southern Greenland. The members of the team were Shona Comrie of Portskerra; Simon Copsey and Ken Nicol, both of Halkirk. A photograph taken by Ken Nicol, from the Pentland Canoe Club, during a recent sea kayaking expedition has taken second prize in the annual Scottish Canoe Association's Touring Photo Competition. The photograph was taken near Frederiksdal in South Greenland and shows fellow Club paddler Simon Copsey dwarfed by an iceberg.